Tell Neutrogena to Stop Testing on Animals! Thank you! You’ve now shared this petition on Facebook. I don’t believe animals should suffer just so we can feel more beautiful. After watching those videos, I was determined to do anything I could to stop these practices. I started to write letters to these companies, including Neutrogena, after I learned that PETA had blacklisted the company for its animal testing practices.Neutrogena is one of the largest and most influential beauty care companies in the world. These beauty care company labs apply and inject chemicals into the animal’s skin or eyes to test the reaction of the substance to skin and organs. These badly damaged lab animals rarely receive any care for the injuries inflicted upon them during the testing process, and all are killed when they are no longer considered useful — usually by asphyxiation (suffocation), or decapitation. This gruesome reality is part of the reason why 50% of U.S. adults are against animal research testing — according to a recent Pew Research Center poll. But none of it is necessary. Beauty companies can use some of the many chemicals that have already been proven safe. Or, they can choose to use non-animal testing methods. Ayame Lewis started this petition with a single signature, and now has 305,276 supporters. Start a petition today to change something you care about. We have reached more than 100 signatures! Thank you! Please keep sharing this petition. It’s absolutely incredible that a brand that advertises its products as all natural and healthy barbarically tests its products on helpless, innocent animals when it’s been proven that it’s absolutely unnecessary. Animal testing should be abolished totally everywhere and everyone should boycott Neutrogena products until they announce that they’ve done so permanently. I’m horrified that I have purchased your products, thinking them ethically responsible. Please discontinue animal testing immediately- there are alternatives! 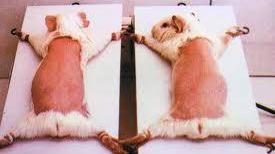 stop torturing , killing and using animals in your testing…use humans, they are going to be using the damn stuff! Previous Previous post: Victory – House Votes to De-Fund V.A. Dog Labs!